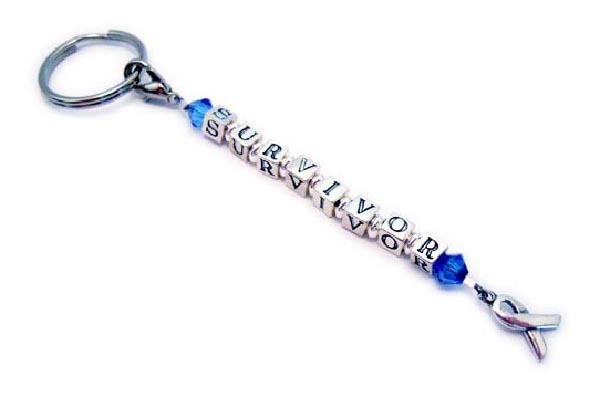 This "Survivor Key Chain" has Survivor spelled out in 4.5mm sterling silver block letters. You may put a name, a message, a bible verse, a phone number, any letters or numbers you would like. Eight letters or numbers are the max because it will be too long with more than that. It is shown with navy blue Swarovski crystals for Colon Cancer. You pick the colors of the crystals during the ordering process. You may pick 2 different colors or have both colors the same. If you need more than 2 just let me know. I can adjust the design. It comes with the .925 sterling silver ribbon charm shown. You may add additional charms.